"You're about to Discover the Exact Strategies I Used to Build a Million-Dollar Internet Business!" ...all I had to do was modify the sales letter, create a squeeze page and recruit affiliates to give away my free offer. That's as easy as it gets my friend! And after you do this a few times, it only takes a day to set up a new offer and make thousands of dollars overnight. I'm not gonna try to convince you that having your own affiliate program will make you rich. But It obvious works like crazy for me and I have no doubt it will work for you. * Affiliates send me thousands of visitors every day! And all you have to do is come up with quality products to promote! It's like turning on a traffic switch...and the best part is, you don't have to pay a penny until you get the sale! Hint: There are secrets to getting affiliates excited about your offers. And you'll get all the details in my Surefire Profits Marketing Course. Look at it this way...you can spend your time or money getting 1,000 people to your site or you can get 10 affiliates to send you 100 visitors each. 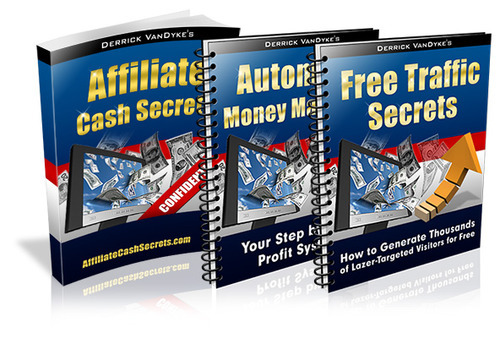 When you harness the power of affiliates, you can build a list for FREE and you only pay when they generate sales! Let's say you have a site with a squeeze page that converts 30 of your visitors and a product that sells for $20 and converts 5 of your leads into sales. As I said, those are extremely conservative numbers. But I don't want to be unrealistic. If you could get 100 people to send you just 20 visitors per month, you would generate 800 leads and $800 in sales. But it gets even better...because the 95 who didn't buy are on your list and you can follow up, make more sales, and promote multiple affiliate products too! If you want to make five figures per month...I'm talking $10,000 to $50,000 every month, then you need to take it up a notch and add a continuity program (membership site) to your business model. When I opened my first membership site my income jumped to $10,000! And it just kept growing every single month. Recurring income is what keeps my business alive when I take vacations or just feel like getting out on my boat in the summer time. You can take time off and the payments just keep coming in like clockwork. * Send email updates and remind them what's coming next! This is the easiest way to build and retain a membership base...and when those payments start coming in you're gonna wish you had done this sooner! You do NOT have to create the content! You just come up with an idea and then outsource the work or buy the content. If you had 100 members paying you $20 per month, would you be willing to pay $500 for the content? You can even outsource the maintenance. One of my membership sites is 100 hands free because I pay someone to upload the content every month. And that site continues to churn out thousands of dollars every month! How many ebooks would you have to sell at $27 each to make $100,000 in a year? Assuming your transaction fee is around two dollars, you'd have to sell 4,000 ebooks, which is 333 per month, or 11 per day. Do you think you could get 100 people to give you $20 per month? If you did that every month, you'd have $2,000 compounded monthly, which is $156,000 after one year plus $12,000 in monthly residual income! And if you think it's too hard to set one up and create new content every month, it's not. I'll show you how to get your membership site up and running in less than a week without doing any of the hard work yourself! Now I'm not saying you shouldn't sell ebooks. They make great front-end products and you can build a huge list by giving your affiliates most of the commissions. But if you want to build massive recurring income then you eventually need to start a membership site. Note: I'll teach you everything you need to know about setting up membership sites, adding upsells and downsells and making tons of money in my Surefire Profits Marketing Course! Zig Ziglar said, "If you help enough people get what they want, you'll get exactly what you want." That's it! That's the million-dollar secret and you can use it to be incredibly successful online. Now did you notice that I'm placing all the focus on the affiliate? To me, making money online is all about empowering people, gaining their trust, and getting them to help you build your business. And you do this with honesty, integrity, and sincerity. And of course you will make money by referring other people, which helps you even more. That's a pretty cool concept...don't you think? Now stop for a minute and think about how you can integrate that philosophy into your marketing. You can make a LOT of money by helping others succeed at making money, saving money, looking beautiful, losing weight, getting better sleep, saving on gas, and the list goes on...you just need a system that will help you get your information out to the people who need it. We'll take an in-depth look at a few different business models and determine which one is right for you based on your level of experience... So you can get up and running as quickly as possible. * How to maximize profit potential with upsells, downsells, and continuity programs. * What you should add to your your download page to boost profits by 50 or more. * How to automatically remove people from a prospect list and add them to a customer list when they make a purchase. If you don't have a website now, I'll give you a step-by-step roadmap for buying a domain, setting up your FREE hosting account, and hooking everything up to the Surefire Profit System software. * My 3-step process for picking niche markets that have the highest profit potential, the easiest market to get into, and why it's so profitable. * The best content delivery methods, which ones have the highest perceived value, and how to choose the best method for your product. * 7 quick and easy ways to create content for your products and how to decide which one is the best fit for your audience. We'll look at the 3 distinct phases of a successful product launch and why each phase is critical to your long-term success. If youve never launched a product before, this step-by-step blueprint will make it easy. * The pre-launch phase. This is where you get people excited about your upcoming launch so youll maximize your chances of getting a nice profit windfall on launch day and soon after. * The launch phase. This is where you start to snowball your marketing efforts to build your profits and your list now that your product is available to the public. * The post-launch phase. This is where you streamline your operations and build your ongoing income. It doesnt have to be an award-winning marketing performance with all the big names on board. You can use this system to sell any product at any price level. All you need is a simple game plan to follow that has been proven to work over and over again. It can be intimidating to think about creating information products from scratch, especially if youre not a great writer or an expert on your chosen topic. And even if you are a great writer, you may not have the time or expertise to create a product yourself. * First, Ill give you a simple five-step approach for using resell rights of various types to develop your product very fast. There are definite advantages to this method, and its one you should consider. * Then Ill give you a simple four-step approach for creating your own product quickly and easily. Yes, itll take a little work, but probably far less than youre imagining right now. * Finally, I'll show you how to edit and package your product and how you can outsource most (if not all) of the work. In the final week of this training, I'll help you set up your affiliate program so you can get other people to send you traffic and build your list. Tip: If you support your affiliates and give them the promotion tools they need to succeed, you'll never have to worry about traffic again. Your affiliate program will leverage the traffic you generate and build more traffic without any extra work. In other words, when a prospect becomes a buyer, that buyer will also become an affiliate who will promote your product creating a snowball effect on traffic, leads and sales.